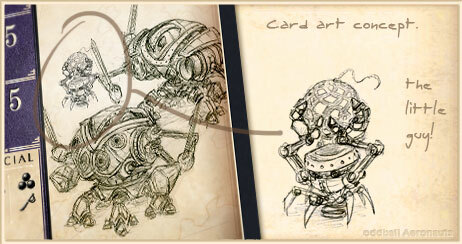 Thank you to all who voted on facebook, deviantart and twitter for the Imperial Bot card art idea – it was, again, a head-to-head race between two of the three contenders and at the end we were left with, yet again, an unclear victor! So what about the other guy? Excluding Events there are a few thematic types of card in each Faction: the Crew, Officers and Support. The Bot card is a support card. An Officer card has one main figure dominating the art side of the card, though possibly accompanied by an aide. Crew cards show two or three figures to give the idea that it is a squad. Support cards vary and may have one, two or more figures depicted. The Bot card whose bots were put to the vote has space for at least two bots. Though bot #2 was first to the finish, bot #3 had an equal number of votes at the end. 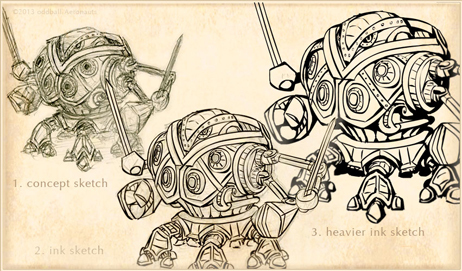 Therefore, given that bots are not all alike – being as individual as their fae pilots – it works well to have bot #3 as the other bot. Plus, there’s space for a little guy at the back – a bot to load the others’ guns. Or a yeti.